Lakshmi (sometimes credited as Lakshmi Narayan or just Laxmi) hails from a South Indian family. Lakshmi is best known for her title role in the Hindi hit film Julie (1975) for which she won the Filmfare Best Actress Award.She also directed a Kannada movie Makkala Sainya. Her father Yaragudipati Varada Rao (aka Y.V. Rao), originally from Nellore, Andhra Pradesh, was a filmmaker and actor whose films dealt with important social issues. 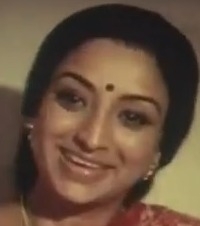 Her mother Kumari Rukhmani was a Tamil actress, whose mother Nungambakkam Janaki was also an actress. They eased her into films, making her a third-generation film actress. She was fifteen when she started acting in films. Her first film was a Tamil film titled Jeevanamsam (1968). She became a star in South India in the 1970s acted in all four South Indian languages: Kannada, Telugu, Tamil and Malayalam. Her Malayalam film Chattakari (1974) was remade in Hindi as Julie (1975) and in Telugu as Miss Julie Prema Katha (1975). In addition to the Filmfare Best Actress Award, she won an award from the Bengal Film Journalists' Association Awards for most outstanding work of the year, for her work in Julie. After her success in Julie however, she didn't star in many Hindi films and instead concentrated on doing more South Indian films. She won the National Film Award for Best Actress for the Tamil film Sila Nerangalil Sila Manithargal (1977), becoming the first South Indian actress to win in that category for a Tamil film. When her career as a leading lady ended in the 1980s, she started playing supporting roles as mother and later as grandmother. She played Aishwarya Rai's grandmother in Jeans (1998) and Kareena Kapoor's grandmother in Hulchul (2004). She has performed in more than 400 films and has also been involved in politics. Lakshmi took a break from acting to host two talk shows, including the Tamil talk show achamillai, achamillai. After the talk shows ended, she returned to acting in films. She is fluent in all four South Indian languages. She presently hosts a talk show in Kannada for Suvarna channel called "Edu Kathe ala Jeevana". Lakshmi was married three times. Her first marriage was to Baskar, which was arranged by her parents when she was seventeen. Her only biological child, Aishwarya, was born in 1971. Her marriage ended in divorce, and she gained custody of her daughter, who later became an actress in the 1990s, making her a fourth generation actress. Lakshmi fell in love with her Chattakari leading man Mohan, but that relationship ended. While she was shooting En Uyir Kannamma, she and actor-director Sivachandran fell in love and got married. Her daughter Aishwarya, gave birth to a baby girl in the mid 1990s, making Lakshmi into a real-life grandmother. Lakshmi adopted a baby girl in 2001.